That’s my synopsis of this report by the Harvard Berkman Center for Internet & Society. Sites on the left adopt more participatory technical platforms; are comprised of significantly fewer sole-authored sites; include user blogs; maintain more fluid boundaries between secondary and primary content; include longer narrative and discussion posts; and (among the top half of the blogs in our sample) more often use blogs as platforms for mobilization as well as discursive production. One of the authors of the study has more nuanced thoughts in this interview. Sites on the left are echo-chambers in which like-minded individuals come together to tell each other how smart they are, in the comfort of a platform provided to them by ideological gurus (can you say Arianna, Markos and Jane) who lead these bloggers to pre-determined fundraising and political action while deluding the bloggers into thinking they are part of a grassroots movement so they can feel good about themselves. Right-wing bloggers, by contrast, exhibit the rugged individualism that built this country, defeated fascism and communism, and put men on the Moon. In terms of “participatory technical platforms,” they’re talking about the use of Scoop and other diary-based platforms that allow dozens or even hundreds of users to create their own subblogs, often with a chance of being bumped to the main page by a group of editors, and commenting systems like Disqus that are hosted off-site and allow integration with other social media sites, sharing with the commenter’s own community, and so forth. Conservatives tend to be less likely to experiment with such models because they necessarily mean giving up control. 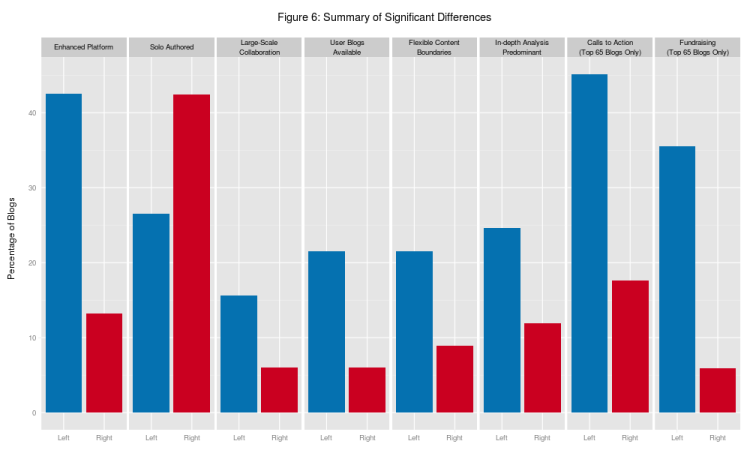 Left-wing blogs, through their collective action, were more effective politically in the short run, i.e. 2006 and 2008 elections. This success will end for the left-wing blogosphere in November 2010, because an effective platform cannot make up for an unpopular message, in the long run. Have you read conservatives4palin? Are you serious? Haven't you learned from Goldberg the problems of speaking in generalities? My synopsis is that l/w bloggers know what they're doing: they're trying to have an impact. R/w bloggers, OTOH, are like the old joke about the thrice-married virgin. What's funny about the study is that they have the late jonswift as a r/w blogger, when he was actually a parody of one. What's also funny is that I probably get more traffic or at least have more of an impact than some of those on their list. But, then again, I run a site and not a blog. No, no, no. Not hand-holders. Bed-wetters. Have you ever read Kos? Most of the blogs are so slanted that they have very little truth to them. They have a running poll of the popularity of Obama and it has not been accurate for at least 8 months. I am suprised by the lack of knowledge on the left and the inability to formulate logic. Maybe something is structurally wrong with them. "Maybe something is structurally wrong with them." I generally agree . . . but "Maybe?" We humans admire the ability of parrots to mimic what some say, but only because they have no inate capacity for reason. Otherwise, we'd think they were just jerks. Note how many of the larboard-leaners resemble sloganizing parrots, endlessly repeating the same tired tripe. And they so frequently do that while employing the legendary polly propensity for repetitive and unnecessary foulness of speech. Buckjohnson, is your comment a self-parody? Referring to ONE blog, then citing "the problems of speaking in generalities"… hmm. Really? We're getting our undies in a wad about technology? Your letting the message prejudice you against the medium. The lefty bloggers, while wrong on nearly everything are using some really slick platforms with really cool user interfaces. Now, that's not important to everyone naturally. You can have an awful looking website if you want. The only difference between the platforms they use and townhall is that town hall is ugly and poorly structured. Yeah. Lets celebrate our technical inferiority!!! Jesus. No wonder they think we're all cave men. How bout I chalk it up to a failed attempt at humor and you get back to beating them with reason. It's what your best at and I mean that sincerely.